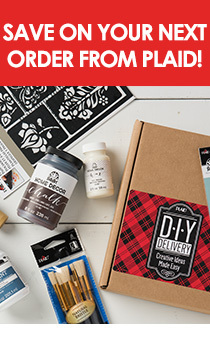 HomeBlog June 2016 Plaid Creator's Milk Paint Makeover: 8 DIY Home Milk Paint Projects! Plaid Creator's Milk Paint Makeover: 8 DIY Home Milk Paint Projects! Recently, our Plaid Creators were among the first to test out FolkArt's new pre-mixed Milk Paint & Finishing Oils. This line of gorgeous colors are true casein-based paints that brush on as smoothly as a stain but dry to a beautiful flat finish. Unlike the typical powdered ready-to-mix milk paint, FolkArt Milk Paint won't spoil, nor will it fade over time or chip and peel because it was specifically formulated to absorb directly into a porous surface! The looks and styles that FolkArt Milk Paint is capable of are limitless, but our Creators took things a step further. They are not simply refinishing with the paint, but also building, upholstering, and designing! Check out their beautiful creations below! Erin of Erinspain.com found an old side table from her newly-wed days in the basement and gave it new life using FolkArt Milk Paint in Monument Gray. See how she did it (and the cute way she styled it) here! Amy of One Artsy Mama used FolkArt Milk Paint in Pink Dogwood to paint an adorable children's rocking chair to match the soft teal, white, pink, and grey accents in the room of her niece, Claire. Finally, she finished off the chair with a hand-lettered embellishment. You can tell from the pictures that Claire loved it! Beverly of Flamingo Toes took on the Milk Paint challenge with an extra dose of furniture reviving, both painting and reupholstering the desk and chair "Gossip Bench" set. In addition to showing her painting method, she also provides a super easy how-to on reupholstering and re-cushioning any chair! Finally, to give the piece more of a vintage look, Bev also used a light distressing technique, a method that is super easy with milk paint! Check it out! Meanwhile on Cherished Bliss, Ashley used a mix of FolkArt Milk Paint in Milk White, Pink Dogwood, and Petticoat to paint and build an adorable crate side table for her daughter's room. In addition to being a beautiful piece, the side table is super versatile as the crate building blocks allow a variety of options for moving and rearranging displays. See the display Ashley and her daughter came up with here! In a stark contrast to the other more pastel project's we've seen thus far, Kathy of Petticoat JUNKtion uses FolkArt Milk Paint in Pirate Black to turn a dated and drab auction coffee table into a chic piece that compliments the mod black accents in her living room. With a bit of distressing and the addition of a mirror to top her table, the chic makeover was complete! See the amazing drab-to-fab piece here! In a step away from the furniture pieces, Abbey of The Cards We Drew used FolkArt Milk Paint to create colorful wall accent pieces to displayer her succulents in her new indoor patio! Abbey used thin pieces of Balsa wood to define the geometric shapes of her piece, and the project turned out beautifully. Sisters Liz and Sam of The Pretty Life Girls collaborated on Liz's daughter's dollhouse dream. Using a handy-dandy doll house kit for their wooden base, Liz painted the walls with four FolkArt Milk Paint colors: Pale Peach, Monument Grey, Milky White, and Tavern Ale before using Mod Podge to add "wallpaper" accents to the house. The finished project, complete with milk-paint-painted furniture and dolls is absolutely adorable. Seriously. We want to live there. Last but certainly not least, Katie of Made To Be A Momma used wooden frames and Milk Paint to create a beautiful gallery display wall for her children's artwork. These Milk Paint frames in a variety of colors bring an awesome cohesiveness to the wildly imaginative and very colorful kids' artwork, and makes an empty wall instantly fun! Get inspired to make such a display for your own kids here! Want to learn even more about FolkArt Milk Paint & Finishing Oils? Click here for more info!